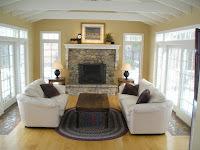 The design task here was to take a large space and make it cozy, comfortable and family friendly. The first step is to ALWAYS start with a floor plan. It is so important to know what will fit in the space. From there I create a layout. A living room with a fireplace and TV are always a challenge. Here is how I solved it. There is a large TV on the wall opposite the fireplace that is on a heavy duty swivel. The sofas with high arms were chosen so that people could sit back on the arms or lay down to face the TV. The two leather chairs are recliners. This layout comfortably seats four for TV watching. When the TV is not in use the focus in on the fireplace and the central conversation area. The two white side chairs in the foreground are overflow seating for the dining room. 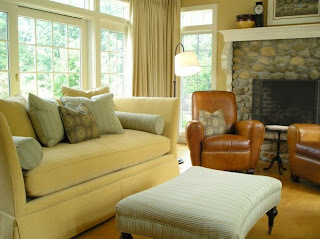 I love the flexibility of side chairs that can be moved around into other rooms as needed. 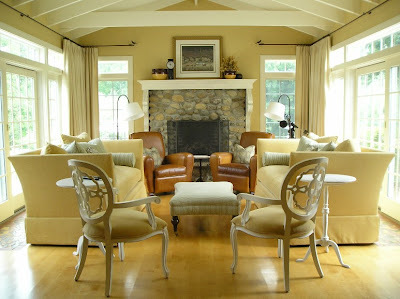 The custom drapery adds a needed softness to the space. Coordinating the fabric to the wall color is elegant and simple. I brought in just a touch of whimsy with bird finials on the iron rods. 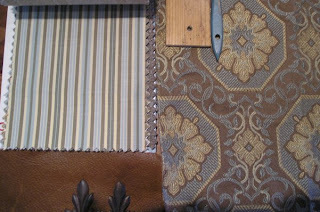 Redecorating and refurnishing a room takes time. It is important to have a plan and implement it as your time allows.